Congratulations are due again to the Louisville Cardinals for their run to a basketball championship this past season. Louisville had one of the great college-level teams I’ve seen in some years. They were balanced with veteran leadership, skill players, young talent, and had a potent batch of bench players. This kind of squad used to be routine in college basketball, but has become a vanishing commodity. 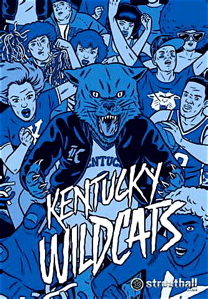 We are spoiled around Kentucky, with several examples of historically successful college basketball programs to admire. There are 16 national championship banners hanging in gyms within two hours of each other at UK, UL and IU. Last season these three schools began the season ranked 1-2-3 in the nation. That could be looked upon as a coincidence, but it was not. Living around these universities and their fan bases, it was blatantly clear considerable work, planning and effort went into making this level of preseason recognition possible. That Louisville and Indiana enjoyed strong seasons was expected, the surprise was the weak mental state of Kentucky’s team and its lack of physicality and leadership. There was a ton of talent on this young Wildcat team, and they won over 20 games, but the one-and-done system run by Coach John Calipari leaves little room for error. This time around there was no bench to speak of and Calipari ended up being more of a psychoanalyst than coach to this batch of young guns suffering from an inferiority complex. Once freshman phenom Nerlens Noel went down with a blown knee the season was over. Archie Goodwin showed flashes of brilliance and Willie Cauley-Stein made great strides in maturity, but the Wildcats were embarrassed in a first round NIT loss to Robert Morris. Some detractors might want to gloat at this result, but do recall this same system ran away with a national championship just the year before, and Noel in all likelihood will be the overall No. 1 pick in the upcoming NBA Draft. It was a flat year, and that is a risk under Calipari’s system, but on paper, next year is looking to be epic. It’s a strange thing about college basketball in Kentucky. It never goes away. Baseball, NBA, college and pro football can all come and go, but just beneath the surface, if even that, are expectations for the next basketball season. This is especially true with Kentucky’s fans. Part of this has to do with Kentucky not having any pro-sports. Indiana, North Carolina, Ohio, California and Kansas, all states with other prominent college basketball programs, all have at least one pro-team around town. In Kentucky UK is king. Louisville is respected and admired as a worthy opponent, but Kentucky runs its program like it is an NBA franchise. 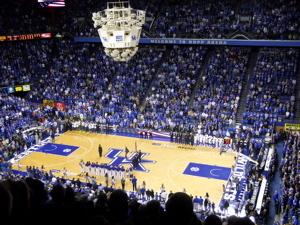 The Wildcats play their home games in Rupp Arena, which is the largest arena in the United States built specifically for basketball, with an official capacity of 23,500. As a result, Kentucky consistently ranks first in the nation in home game attendance. The locker room at Rupp underwent a $3.1 million renovation last year, courtesy of two major UK basketball boosters. Much of the original flooring from the 2012 NCAA Championship game in New Orleans was installed. A special booster room allows VIP contributors to see the players through glass as they walk into the arena – making it sound like they are zoo animals on display. Rich, wood-paneled lockers, in a circular arrangement strike a serious tone, and top-end interior design and furniture finish this posh “college” attraction. The majority of the funds came from Joe Craft, who heads Alliance Coal. He also put enough cash into a $30 million state-of-the-art basketball practice facility that it was named the Joe Craft Center, and lined up a group of UK supporters called the “Difference Makers,” who came up with $7 million for the new Wildcat Coal Lodge, where the team lives in catered luxury. Rick Pitino, the head coach at Louisville, made just shy of $5 million last season. In most states that would easily make him the highest-paid public employee, but not in Kentucky, where Calipari made $5.4 million. School’s can pay coaches whatever they choose, but this blind emphasis on the importance of UK’s success, over education, reeks of desperation at some level. It’s the misappropriation of propriety. Fans of the Big Blue Nation will spin this as “pride” in the state’s premier sports franchise, but it’s hard to hide the amount of time, money and hot air spent in the production of a Kentucky basketball season. As a reference, the average pay for coaches in this year’s NCAA Tournament was $1.47 million. Admittedly, all the big schools pay their coaches extravagantly. In particular Duke, where Mike Krzyzewski made nearly $9.7 million in total compensation during the 2011 calendar year. But don’t think that paying coaches at this level doesn’t send a misguided message to young people, that our value system is out of whack. I get that these programs generate revenue and untold millions in free advertising. I’m no hater. I like to see Kentucky do well. I like to see Louisville do well, along with Western, Murray State, Morehead, Eastern, whatever. When these teams do well, when they play on a national stage or compete for championships, that raises the profile of the Commonwealth, and I am all for that. I see what that money has done for the college campuses in Kentucky. It has also led to increased enrollment and a better quality of student. It would be nice to see a reality check for all these monster programs, and have education return to the forefront, but that horse left out long ago. You can’t necessarily trust the presidents and administrators to do what is best for our schools either, so as a society we have grown accepting of prostituting our primary higher education institutions to the deity of athletic prosperity. That being said, Louisville will be right back at the top of college basketball next season. They may have lost Peyton Siva and Gorgui Dieng, but the core of its national championship team returns with Russ Smith, Wayne Blackshear, Chane Behanan, Luke Hancock, and Montrezl Harrell, along with perhaps Kevin Ware, and prize recruit Terry Rozier as well. The Cards have talent and great team chemistry. No doubt they will be ranked high and win a bunch of games, but I argue this remains a nice “college” team. It’s not quite as good as the previous one and lacks that key guy who is a legitimate NBA first round impact player. Last season happened to be one of those years in college basketball that broke right for Louisville because there wasn’t any talent-laden team like the 2011-2012 Kentucky Wildcats. 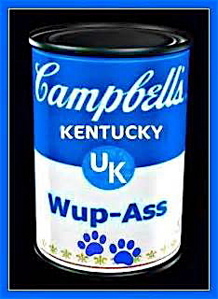 Well the grace period is over, because UK appears to have another dominant squad on tap in Lexington. Not only does Kentucky have the consensus No. 1 recruiting class in America, the fifth time in a row Calipari has inked such a distinction, but it is being regarded as the best class in college basketball history. Calipari has been honest and vocal about wanting to lead a team to a career-defining 40-0 record. Most coaches would never want to publicize such a gaudy goal, but Calipari is a carnival barker at heart. He loves the spotlight and his kids dig him for it. Most of these recruits know they will only be in college for one year. Anything short of a championship will be seen as a failure by their own standards. 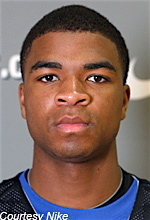 It starts with the twins, Andrew and Aaron Harrison, SCOUT.COM’s No. 5 and 6 overall players in the country. Ryan Harrow could not run the show last year and he has transferred. Both Harrisons are 6-foot-5, and hail from Richmond, Texas. Then there is the beast, Julius Randle, from Plano, Texas. At 6-foot-9, 240 pounds, this guy is a load and is the overall No. 2 recruit. He and the Harrison twins have been playing against each other their whole lives. Now they get a chance to combine their competitive ambitions and focus them against outside opponents. Dakari Johnson, from Montverde, Fla., is a towering 6-foot-10, 265 pounds – Rivals ranks him No. 9. Marcus Lee, 6-foot-9, from Antioch, Calif., is the No. 5 power forward and 19th-best overall player. James Young is a 6-foot-6, 200 pound swingman from Rochester Hills, Mich, and the overall No. 11 player. Allow me to do the math for you, that is six McDonald’s All-Americans heading to Lexington next year. Additionally, there is 6-foot-8, 190 pound, Derek Willis, from Mt. Washington, Ky. Willis is already familiar with Rupp Arena, having played in the state high school playoffs with Bullitt East High School. He is listed at 115th nationally, 25th at his position by analysts. And rounding out this squad is another familiar face, 6-foot-1 guard Dominique Hawkins, who was Mr. Basketball in Kentucky, and starred for the state champs at Madison Central in 2013. 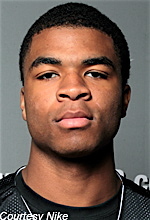 Hawkins may only be listed as a three-star recruit, but he scored 29 points against the heralded Harrison twins when their two teams met in the second game of this past season. Hawkins isn’t afraid of the competition. These newcomers will join three returning starters in Willie Cauley-Stein, Kyle Wiltjer and Alex Poythress. UK’s roster easily includes 10 players that could start for a vast majority of Division I programs. Which five get the honor of starting will largely be determined on the practice floor. The intrasquad games at UK will be fiercely competitive. In most instances these players will see better competition in practice than they will in actual games. That wasn’t the case last season. “With people that hate losing, there’s bound to be fights,” said forward Marcus Lee. Just walking into practice will force these kids to step up their games, because if you don’t bring it you will not play. Those six McDonald’s All-Americans and the other two recruits came to UK just so they could fight it out in practice and compete for who is best. This entry was posted in News and tagged Indiana Hoosiers, John Calipari, Kentucky Wildcats, Louisville Cardinals, Rick Pitino, University of Kentucky, University of Louisville. Bookmark the permalink.